Just sit back and watch out a short video about us ! 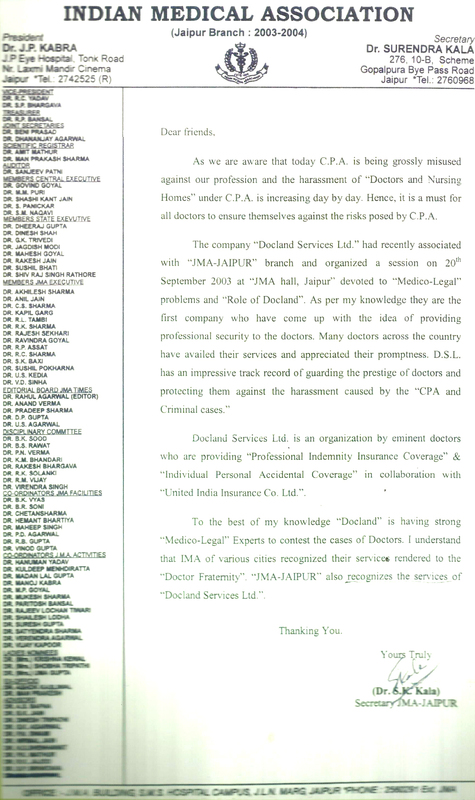 Docland Services Ltd. shall defend all type of professionally related medical negligence cases as and when initiated on its members, from Lower Courts upto Hon'ble Supreme Court of India, till its disposal, without any additional fee. 1). Round the clock service availability. 2). Legal Services from Lower Courts to Supreme Court. 5). Legal assistance / advice / suggestions from top most professionals. 6). Services of Medico Legal Experts. Availability of Legal experts anywhere as per requirement. 7). Settlement of compensation / claim, if any, from the insurer subject to taking insurance coverage through Docland. 8). Free from appearing court, except directive of court. 9). Arrangement the insurance coverage as and when required by the members under Professional Indemnity Insurance/ Errors & Omissions Insurance, provided that the member has remitted the applicable premium for the coverage through A/c payee cheque, in addition to the above membership fee. 10). Doorstep administrative service support, pertaining to the above cases, to its members, free of cost and also arrange the prompt and proper delivery of the policy documents/ membership agreement at the doorstep. 11). 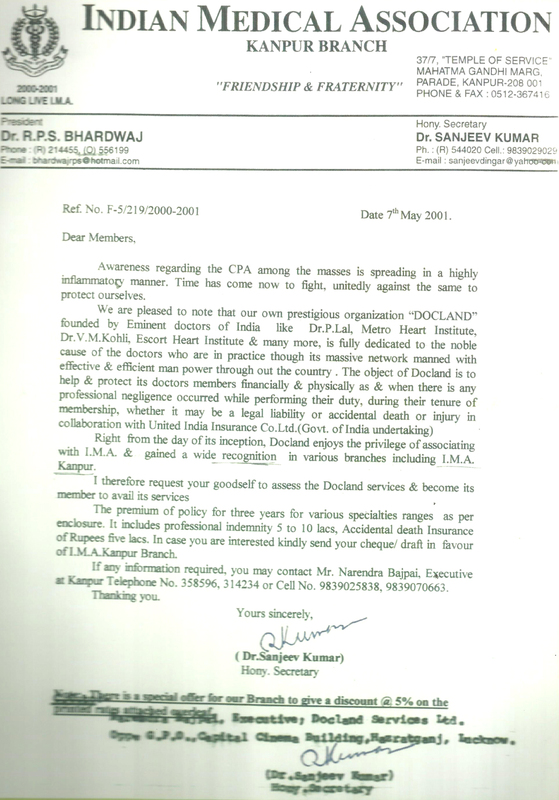 That above all Docland is committed to handle the legal cases of its members confidentially with utmost secrecy,as far as possible, in order to safeguard the reputation / fame and dignity of its members (doctors / hospitals)..
Service rendered while under the influence of intoxicants or narcotics, etc. Evaluate your risk with our comprehensive risk calculator. GIZMO – Your social Network !! ABOUT GIZMO – YOUR SOCIAL NETWORK !! The most trusted online platform for Consultation and Opinion among the peer health professionals. 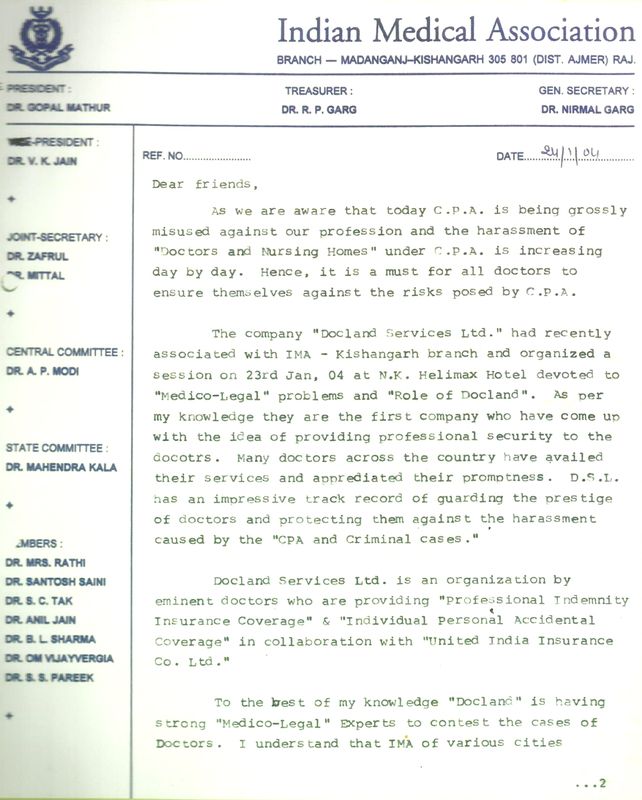 Docland Services Limited was incorporated on 2nd February, 1997 as a Limited Company under the Indian Companies Act, 1956. 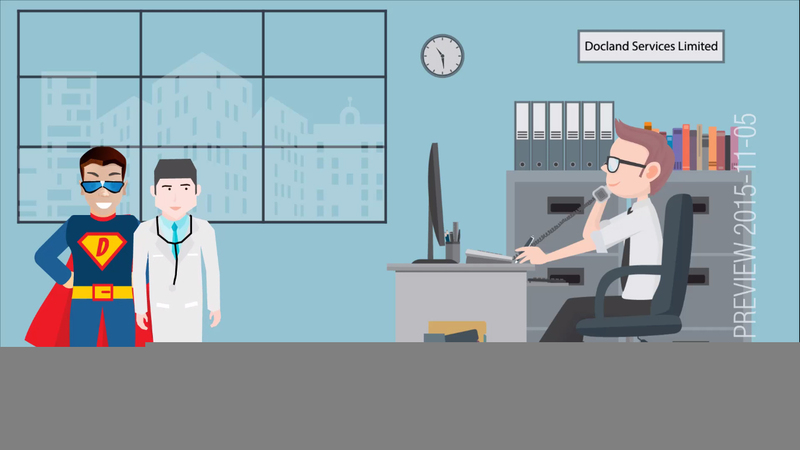 The main objective of Docland is to help and protect the Doctor members / Medical Establishments financially and physically whenever there is any professional negligence occurred while performing their duty, whether it may be a legal liability or a financial liability. DOCLAND Services Ltd. is perhaps the first organized body, which puts all its efforts to provide shield to Doctors/Medical Establishments all over India. 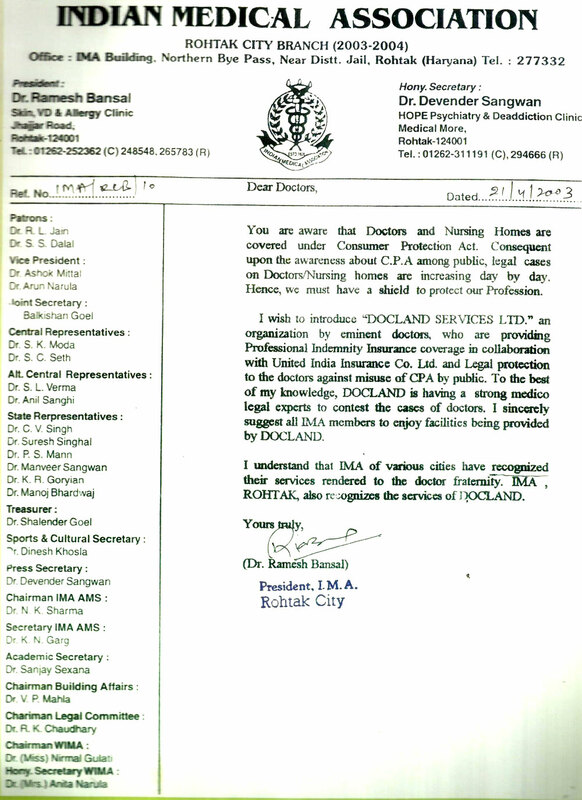 Right from the day of its inception, Docland Services Ltd. gained a wide recognition from the Doctors all over India. During the last 20years of operation, more than 2,00,000 health professionals have registered with Docland and still counting. 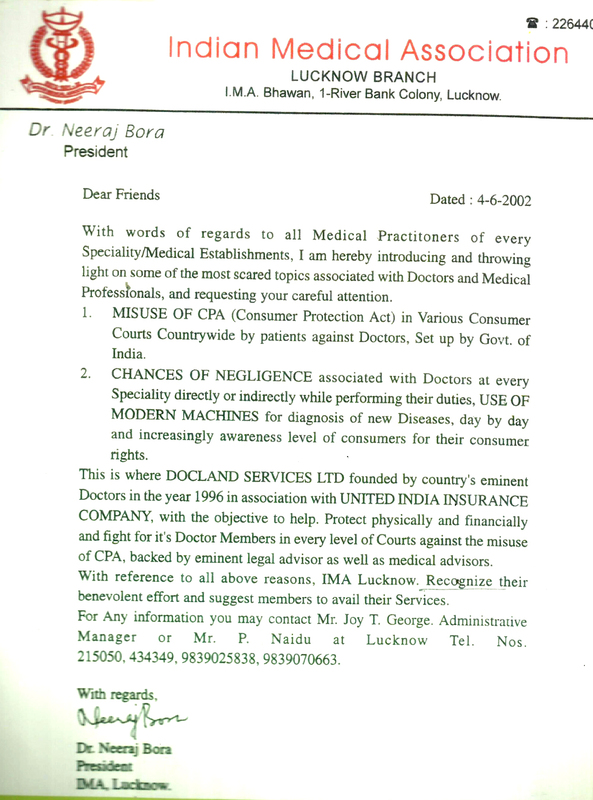 Docland has a very strong legal cell consisting of senior and experienced advocates, retired judges of Hon’ble High Courts as well as Hon’ble Supreme Court of India to contest the cases of its doctor members. Docland also has a medical advisory board consisting eminent and senior doctors from various specialities. Docland feels that such a technical subject such as “medical science” should not be let loose at the hands of novice who does not have the requisite knowledge of the subject, so at the time of contesting a case Docland equips its legal cell with the advice of medical advisory board. Docland does not guarantee “success” in case but assures methodical, industrious and the result oriented efforts. The First and foremost Company in India came out with the concept of providing professional protection to Medical Practitioners / Establishments all over India. 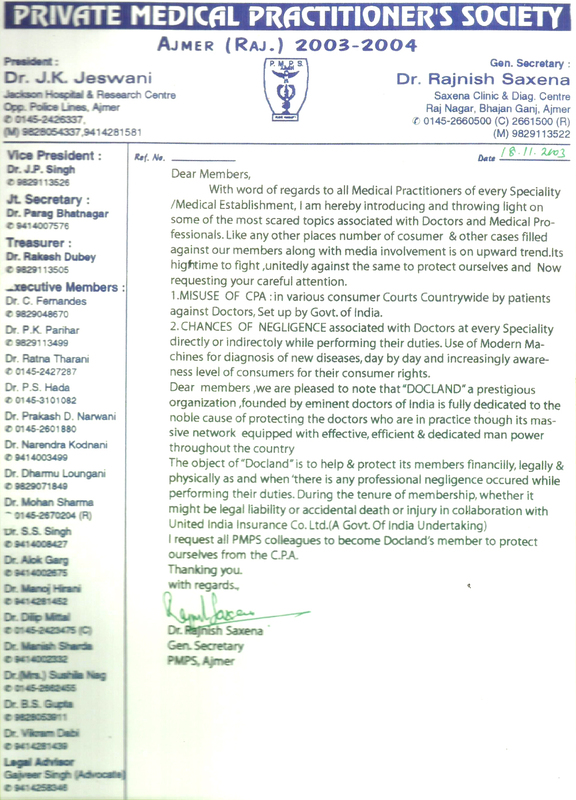 Promoted by the Doctors who knows the beeps and pulse of medical fraternity. Fully equipped field network to sort out the legal problems of our member Doctors / Medical Establishments pertaining to CPA cases. 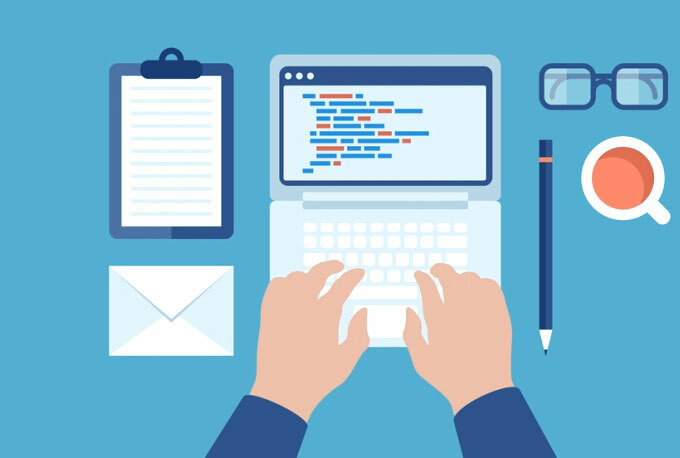 Fully computerized branches to keep update status of the members and to provide uninterrupted indemnity insurance coverage. Best medico legal experts of different branch of medicines in the Panel of Advisors to provide timely guidance to the arguing counsels. We are a young and dynamic team working towards disrupting the professional risk management sector to solve the problems of Healthcare Professionals and Institutions when they concentrate on this profession. The success and eminence of Docland began as the dream of one man extended to be transformed into the dream of many. We strive to accomplish our dreams and goals to bring greater effulgence in the future.Dr. 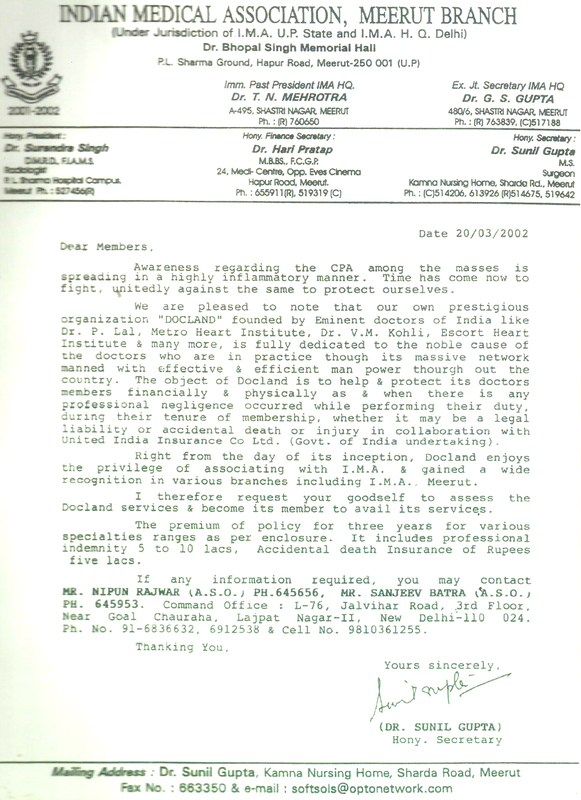 Dey led Docland as chairman since its very inception at 1997. Under his leadership, the company has grown over two decades to become a national leader in the professional risk management of the medical fraternity. He graduated from King George Medical College and pursued his post graduation. Besides holding a vast experience in the field of risk management, he is has expanded his venture into other corporate entities. Meet the transformer. Alright, not the one you're thinking of but he has transformed and cradled the ambience of Docland into the most arduous and sincere entrepreneurship. A very dapper person, he is a dental graduate, a former resident of King George Medical College & foregrounding in genius. We watch him in awe most of the time He wears kilts to work. Well, he doesn't really, but we're hoping he'll start to once he reads this. He is the high-tech entrepreneur; he's the master of cool and a bundle of energy. He also has a wicked sense of humour. Will You Join us ! Committed to complete risk management of health professionals and medical establishments. To continue to be a leader, establish nationwide presence, facilitate management and ellimination of professional risks. 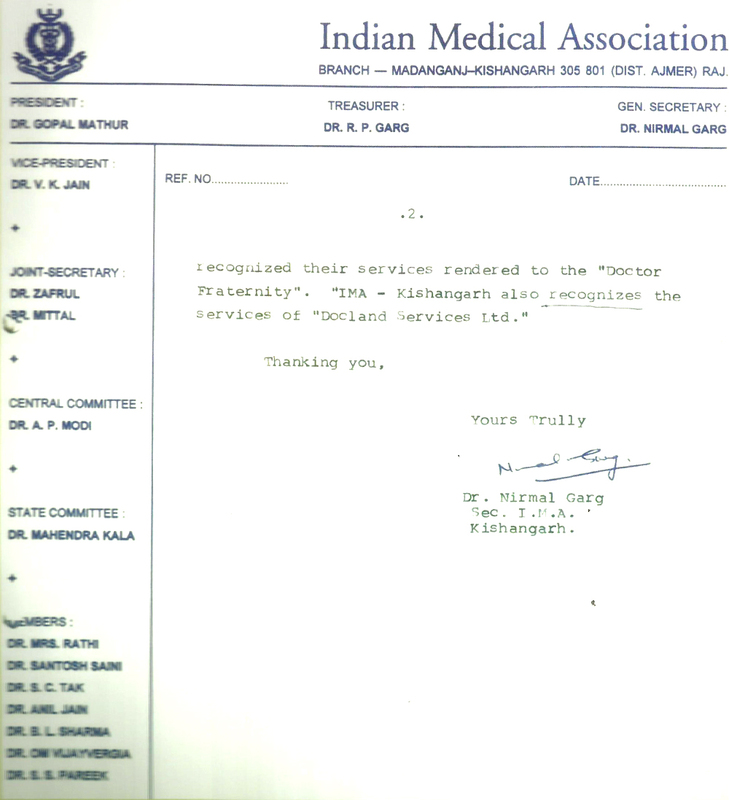 Integrity, Trust, respect and care for Medical fraternity. Cover Amount () In Lacs. Your total years of practice ? Average No. of patients you are treating per day. Are you holding recognized medical degree / degrees or such certificates / diplomas and memberships / honors which confer professional knowledge or recognizes any exemplary qualification / achievements? Are you registered with the State Medical Council / Medical Council of India ? Are you keeping update of the latest advancements in medicine? Have you been ever victimised of past professional risks? Are you insured with professional indemnity policy? Begin your journey at a place where you can give your ideas a stage, create waves of change and empower the generations of healthcare professionals and providers . The time is now, the revolution is here! Team Docland will Contact You soon. Copyright © 2016 Docland Services Limited.